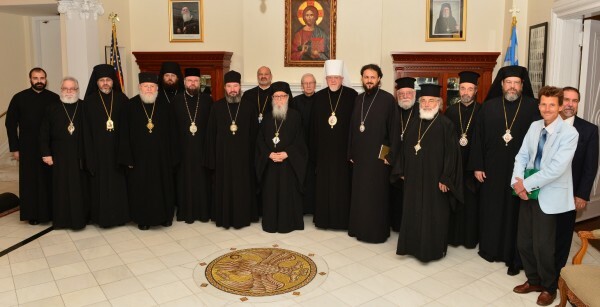 As part of the ongoing work of the Assembly of Canonical Orthodox Bishops of the United States of America, a meeting of the Assembly’s committee chairmen was held on Tuesday, June 10, 2014 in New York. Eleven of the Assembly’s 14 committees were represented. Bishop Maxim, the Coordinator for Committees, convened the meeting. In his opening remarks, His Eminence, Archbishop Demetrios of America, Chairman of the Assembly, commended the hierarchs for their commitment and also acknowledged the critical contribution made to the Assembly by countless ordained and lay consultants. His Eminence also reminded the hierarchs that the work of the Assembly, in particular through its committees, has an even greater significance than in the past in light of the Holy and Great Council, which is scheduled for 2016. Among the endeavors discussed at the meeting, Archbishop Nicolae (Committee for Canonical Regional Planning) confirmed that the task to study and prepare potential canonical solutions to the region’s ecclesiological organization would continue; Bishop Demetrios of Mokissos (Committee for Ecumenical Relations) announced plans to resume the work of the Joint Commission of Orthodox and Roman Catholic Bishops; Bishop Gregory of Nyssa (Committee for Agencies and Endorsed Organizations) reported that a protocol is being developed to help enhance the relationship between the Assembly of Bishops and its Agencies and Endorsed Organizations; and Metropolitan Methodios (Committee for Canonical Affairs) provided a plan for a comprehensive national parish and clergy database that would best showcase parishes and highlight the gifts and talents of clergy.